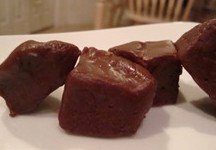 How Long Will Homemade Fudge Stay Fresh? The fudge I'm specifically asking about has peanut butter, chocolate drops, marshmallows, butter, vanilla, and evaporated milk. Homemade fudge keeps pretty well. I make a recipe that is very similar to the one you're describing. Store it in an airtight container in a cool place for a few weeks, or freeze for a few months. To be honest, my homemade fudge doesn't usually last that long, but it does keep well if you can manage to leave it alone. Comments for How Long Will Homemade Fudge Stay Fresh? Like I mentioned to Gerry above, I find that fudge keeps really well when stored correctly. When I want to keep it for a long time, I wrap it well and freeze it. Let it thaw while it is still wrapped. If you want to sore it without freezing you can do so either in the fridge or at room temp (as long as it is reasonably cool. Do try to have an airtight container. This helps keep the fudge from drying out if left at room temperature or developing too much moisture if refrigerated or frozen. I wanted to make candy ahead for Christmas, but am afraid I started too early. Will it be OK in an airtight container in a cool place 3 weeks or so?